I still read the news. I currently get most of my news via the news aggregator, Feedly. The app collects news stories from a variety of sources and puts them all in one place. On a daily basis, I get stories from The Atlantic, The New York Times, NPR, Jezebel, and The Commercial Appeal. I used to get updates from Gawker, but it was sued out of existence. Now, do I read every story posted in Feedly? Heck no. I have a life. However, I love that I quickly scan the headlines, save things to read for later, email, and share stories. The app keeps me informed (and entertained). Notice this screen shot my news feed juxtaposes a story about Justin Bieber and the Zika virus. This is the news. In a lot of ways, I think this is the future of journalism. My feed is blissfully low on advertisements. If I want to read a full story from the New York Times, I have to click through and see their ads. However, most of the time, I can scan and flip through the stories. I read the stories I want without paying a cent. So, when I saw this report on John Oliver’s Last Week Tonight, I felt a little guilty. As he talked about the fall in ad revenue and the downsizing of mid-market newspapers, I realized that I am part of problem. I don’t want to pay for my news, but I still want high quality, expert reporting. I want to learn about Netflix’s plans to revitalize Anne of Green Gables (I know! I know! I can’t wait!) and the restoration of felon voting rights. I want news and entertainment, but not always infotainment. That being said, the other reason this report really struck me was his examples of TV news outlets relying on the hard work of small-town, local journalists. Digital media have had a radical affect on how we source, report, and distribute the news. 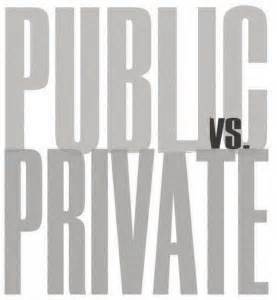 I’m currently rereading Jürgen Habermas‘s (1991) The Structural Transformation of the Public Space and thought about writing a post about that. However, I’m not sure I’m ready to tackle German philosophy in this space … yet. Instead, I want to talk about photocopiers. This boingboing article by Mark Frauenfelder highlights how Xerox did not anticipate the power of the first Xerox photocopier. For example, Frauenfelder points out that, “before the [Xerox] 914 machine, Americans made 20 million copies a year, but by 1966 Xerox had boosted the total to 14 billion.” That’s million versus billion folks! The photocopier radically altered how people shared materials. Before the photocopier, scores of secretaries typed and retyped documents. Sometimes, they could use carbon paper, but mostly, they rekeyed every letter. Every contract. Every business letter. Every promotion form. Every document. Typed and retyped by women. 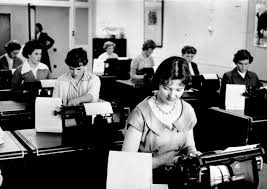 They could use a mimeograph machine, but the were messy, sometimes more difficult to set up, and usually only used for many copies at a time. However, the photocopier changed all that. Suddenly, one machine could quickly, easily, and neatly make a copy. Although, watching the scene in the movie 9 to 5 in which Jane Fonda’s character fights with the copy machine suggests that the machines were pretty complex. Could “any moron” operate that copier? The technologies allowed for relatively fast dispersal of information. Luther’s quote suggests that the speed of copying prevented him from retracting or revising his Theses. The technology decreased the time between composition and publication – the time in which contemplation. revision, and redaction may occur. The Church couldn’t stop the spread. Like this article in The Onion, we tend to anthropomorphize technology. Like the woman in the article, I talk about how my computer hates me or about how my phone seems to know exactly when to run out of battery power. We give machines human emotions and motives. But for how complex these machines are, they aren’t people. Even the Terminator, was incapable of really understanding feelings. It seems dangerous to give technology agency. Talking about how the computer has changed with world ignores the fact that human beings designed, built, and marketed that computer. 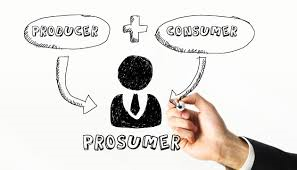 Moreover, it hides the marketing mechanisms behind these technologies. 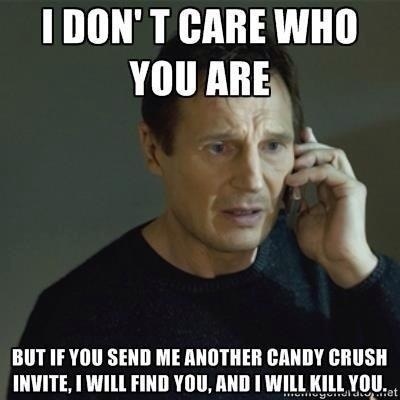 Every day we’re told to buy the latest gadget, the newest app, or more lives in Candy Crush. In fact, in an article in The Guardian, psychologist Steve Sharman points out that games like Candy Crush are designed to be addictive: “The illusion of control is a crucial element in the maintenance of gambling addiction … [as it] instills a feeling of skill or control,” he says. “There are a number of in-game features [such as the boosters in Candy Crush] that allow players to believe they are affecting the outcome of the game, and in some cases they are, but those instances are rare.” In other words, Candy Crush is addictive because people made it that way. The interactivity of these new technologies may explain why we map human emotions onto them. Did medieval monks blame their quills when they split and quit working correctly? Did Gutenberg blame his press for being moody if a lever broke? But my laptop seems to respond to my needs. Now that websites track our webtraffic and suggest things we would like, the humanness of my laptop is greater than ever. And yet, these suggestions come with strings – lack of privacy, access to social networks, and as always, a call for more spending. The concern for how technology will change how we communicate is ancient; in The Phaedrus, Plato recounts the myth of Theuth who brings writing Thamus, king of Egypt. 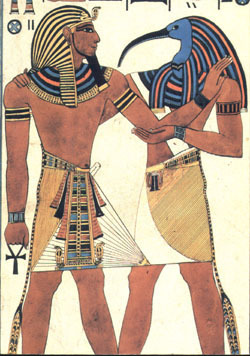 Theuth claims that writing will make the Egyptians wiser. However, Thamus is skeptical: “this invention will produce forgetfulness in the minds of those who learn to use it … their trust in writing, produced by external characters which are not part of themselves, will discourage the use of their own memory within them. You have invented an elixir not of memory, but of reminding; and you offer your pupils the appearance of wisdom” (165). Theuth and Thamus’s dialogue could be neatly transposed onto debates about the advent of digital media; Wired becomes Theuth lauding the advent of computers, while Neo-Luddite Sven Birkerts and others like him take the role of Thamus questioning the value of this new invention. New media have sparked debate for millennia. The anxiety caused by new media may be complicated because humans use technology to communicate and make sense of their world. In The Two Virtuals, Alexander Reid (2007) ties the use of technology to knowledge: “knowledge is produced through the process of externalization, through its articulation in symbols” (29). The cave paintings as Lascaux show early humans using dyes and charcoal to share their understanding of their surroundings. Unlike Plato’s Thamus who fears externalization, Reid argues that technologies are what create human knowledge and culture. People use tools to communicate and to live, and we cannot be separated from them. Tools like the stylus, quill, ink pen, press, typewriter, and dot-matrix printer work with developments like papyrus, velum, linen paper, and wood-pulp paper to help us share and shape our beliefs, our fears, and our hopes for the future. As WELL founder Steward Brand (1993) argues in the first issue of Wired: “The cutting edge of new media is the cutting edge of human cognition, which is the edge of what it means to be human” (43). Technologies shape how we communicate with each other. For example in Orality and Literacy, Ong (1982) claims that media like radio and television resurrect oral culture: “electronic technology has brought us into the age of ‘secondary orality.’ This new orality has striking resemblances to the old in its participatory mystique, its fostering a communal sense, its concentration on the present moment, and even its use of formulas” (133). In other words, new technologies can change how we read, how we participate in popular culture, and how we remain connected to our families. Werner, Daniel S. Myth and Philosophy in Plato’s Phaedrus. New York: Cambridge UP, 2012.